People who love hippos like to proclaim this passion far and wide. What better way to do that than to wear a hippo every day? And that's just what you can do when you buy a pair of our semi-precious stone hippo earrings, a large-hole cable bracelet or bangle, or an attractive, one-of-a-kind necklace. Earrings are a must have accessory for most women. Ours vary in material from ceramic, porcelain, and semi-precious stone to silver plated metal. They are priced low enough so that you can buy several pairs, allowing you to wear whatever your mood calls for. Our exclusive happy swimming hippo image has been magically transformed into a pendant! Black metal square pendant comes with an 18" black leather adjustable cord. Not water proof - please remove for swimming or bathing. Very cute dangle hippo earrings in orange or pink with rhinestone and bow tie studs. Gold-tone hardware. Post back. Height: 2 in. Please choose from pink or orange. A black ribbon runs through a gold-toned chain link bracelet accented by dangling charms including a chunky pink or orange hippo with pearls and bow ties and a wish lock. Bracelet length: about 7" (17.5cm). Hippo charm size: about 7/8" long by 3/4" wide (2.3cm by 2cm). Lock charm size: about 1" long by 5/8" wide (2.5cm by 1.5cm). Please choose from a pink or orange hippo. We've taken our favorite Victorian image of Mister Hippo dancing with his lovely partner and turned it into a delightful necklace. The image is placed in a silver plated charm pendant and covered with crystal clear resin. It hangs from a black leather 18" adjustable cord. 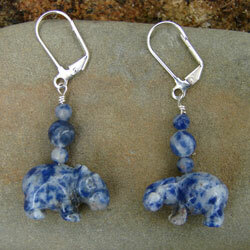 Beautiful blue hippos hang from silver lever-back earrings with coordinating blue beads. These earrings are dressy enough for work and casual enough for weekend wear. Add our darling silver-plated large-hole hippo bead to your Biagi, Pandora, Troll or other European cable style bracelet. Approximately 17x14mm. If you enjoy making your own hippo jewelry, here's the bead for you. Our handcrafted lampworked glass bead is nicely detailed and will act as a marvelous focal point for any whimsical jewelry design. No two beads are exactly alike. These hippo beads measure about 5/8" long (17x14mm).